One of the best ways to experience Grand Canyon National Park is to visit a beautiful viewpoint on the rim. There’s nothing like watching sunrise or sunset from the edge of Grand Canyon. Fortunately, there are dozens of great viewpoints on the South Rim and the North Rim. But which ones have the best views? And how can you avoid the crowds? This page will show you the best viewpoints in Grand Canyon. 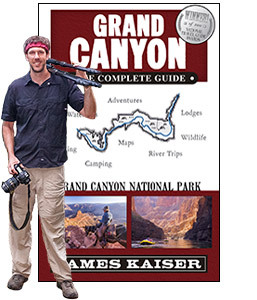 If you find this information useful, check out my award-winning guidebook Grand Canyon: The Complete Guide. This full-color travel guide is filled with beautiful photos and insider tips to help you make the most of your time in the park. Hopi Point is one of the best all-around viewpoints in Grand Canyon. Jutting out farther into the Canyon than any other point on the South Rim, it offers terrific views to the east and west. It’s a great place for both sunrise and sunset. Hopi Point is located along Hermit Drive, which skirts the Canyon rim west of Grand Canyon Village. From March to November Hermit Drive is closed to private vehicles, but there’s a free shuttle that departs just west of Bright Angel Lodge. You can walk to Hopi Point along the Rim Trail. It’s about a two-mile walk from the start of Hermit Drive, and you’ll pass several good viewpoints along the way. Hopi Point offers excellent views of the stone “temples” (rock formations) rising from the depths of the Canyon. Across from Hopi Point is flat-topped Shiva Temple, named for the Hindu destroyer. Just east of Shiva is pyramidal Isis Temple, named for the Egyptian goddess. To the northeast is Zoroaster Temple, named after the Persian prophet. Located just west of Hopi Point, Mohave Point has terrific western exposure, making it a great place for sunset. Mohave Point is less famous than Hopi Point, however, so there are almost always fewer crowds. If Hopi Point is too crowded, simply catch the free shuttle to Mohave Point. You can also walk one mile along the Rim Trail from Hopi Point to Mohave Point. The long rocky promontory that stretches down from Mohave Point is called the Alligator. West of the Alligator you the Colorado River rounds a bend and flows northwest. Look close and you can see Hermit Rapid, which formed when debris from an adjacent side canyon flowed into the Colorado River. Located just east of Hopi Point, Powell Point has terrific eastern exposure, making it a great place for sunrise. Because it’s less famous than Hopi Point, there are almost always fewer crowds. Powell Point is located two miles from the start of Hermit Drive. You can walk there along the Rim Trail or catch the free Hermit Drive shuttle. Powell Point is named after John Wesley Powell, the first man to successfully run the Colorado River through Grand Canyon. A monument to this historic achievement is located on Powell Point. You can climb to the top of the monument, but the best views are located below it. Yavapai Point has the best views between the visitor center and Grand Canyon Village. Perched on a dramatic point, it offers sweeping views to the east and west. Yavapai Point is also home to the Yavapai Geology Museum. Step inside the museum and learn about Grand Canyon’s incredible geology, then step outside and view the Canyon in a whole new light. The only downside to Yavapai Point is its popularity. It’s the best viewpoint between the visitor center and the South Rim’s hotels, so it’s often crowded at sunset. That said, Yavapai Point is generally less crowded than Mather Point (located next to the visitor center) or any of the viewpoints adjacent to the hotels in Grand Canyon Village. Desert View is the easternmost viewpoint on the South Rim. It’s also one of the highest, with an elevation of 7,438 feet (2,267 meters). Located thousands of feet above a sweeping bend in the Colorado River, Desert View offers some of Grand Canyon’s most beautiful views. To the north the Colorado River emerges from Marble Canyon. To the west the Colorado flows into a labyrinth of towering rock formations. And to the east a barren landscape extends to the Painted Desert, making Desert View a terrific place to watch sunrise. You can also climb to the top floor of Desert View Watchtower, a 70-high stone tower that offers 360-degree views. On clear days you can see over 100 miles. 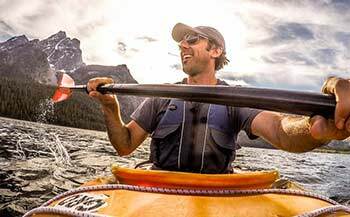 Follow the Colorado River upstream and notice the deep gorge that slices east into a broad plateau. That gorge, which is over 3,000 feet deep, was cut by the Colorado River’s largest tributary: the Little Colorado River. The Hopi believe their ancestors emerged from a sacred place called the Sipapuni near the confluence of the two rivers. Bright Angel Point is the most popular viewpoint on the North Rim. Located three-quarters of a mile from Grand Canyon Lodge, it’s easy to get to and the views are stunning. A bold rock formation called the Transept dominates the scenery to the southwest. To the southwest a series of colossal jagged peaks march into the heart of the Canyon. Between them lies Bright Angel Canyon, which slices through the rocks on its way to the Colorado River. Beyond Grand Canyon’s South Rim lie the San Francisco Peaks – the tallest mountains in Arizona. Bright Angel Point lies at an elevation of 8,148 feet — 1,000 feet higher than the South Rim. Gazing across Grand Canyon from Bright Angel Point, the walls of the South Rim appear nearly vertical. The walls of the North Rim, meanwhile, gradually recede from the Colorado River. This stark contrast is due to varying rates of erosion. Both rims are tilted slightly to the south. Precipitation that falls on the North Rim flows into Grand Canyon, while precipitation that falls on the South Rim flows away from the Canyon. Because the walls of the North Rim receive significantly more runoff, they have eroded horizontally up to 10 times faster than the walls of the South Rim. Cape Royal is the southernmost viewpoint on the North Rim. Located at the tip of the Walhalla Plateau, it’s a 15-mile drive from the North Rim visitor center. To get there drive three miles north on AZ-67 and turn right on Fuller Canyon Road. When the road forks, turn right on Cape Royal Road and follow it 14 miles to a large parking area. A short, easy trail heads to the viewpoint. Directly in front of Cape Royal is Wotans Throne, a flat-topped mesa surrounded by sheer cliffs. Those cliffs, composed of Coconino sandstone, are beautifully illuminated at sunset. East of Wotans Throne is a rock formation called Freya Castle, and beyond Freya Castle is a tiny glimpse of the Colorado River. On clear days you can also see the San Francisco Peaks in the distance. At 8,803 feet (2,683 meters), Point Imperial is the highest viewpoint in Grand Canyon. With sweeping eastern views, it’s also the best place for sunrise on the North Rim. The prominent spire in front of the viewpoint marks the top of Mount Hayden. The 8,372-foot spire is composed of Coconino Sandstone, which formed roughly 265 million years ago when Northern Arizona was covered with massive sand dunes similar to today’s Sahara Desert. Over millions of years, the sand dunes compressed into sandstone. Beyond Mount Hayden, the view stretches out for miles, offering one of the best panoramas in Grand Canyon National Park. To the left of Mount Hayden, the Colorado River flows through Marble Canyon before reaching the confluence of the Little Colorado River. Above Marble Canyon is a broad, flat platform marking the westernmost edge of the Painted Desert. Almost all land east of Marble Canyon belongs to the Navajo Nation. To get to Point Imperial from Grand Canyon Lodge, drive north three miles on AZ-67 and turn right on Fuller Canyon Road. When the road forks, turn left and follow the road until you reach a large parking area. 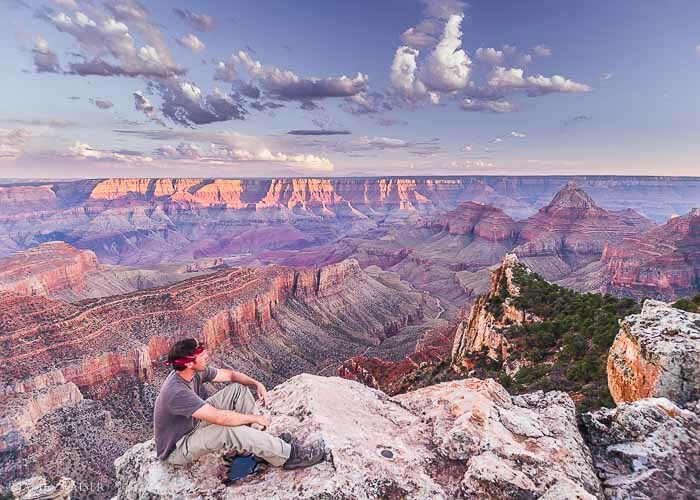 This spectacular South Rim viewpoint is almost always uncrowded. That’s because the turnoff to Shoshone Point is unmarked, and getting there requires walking one mile. The trailhead is located off Desert View Drive, about 1.3 miles east of Yaki Point. The trail starts behind a locked metal gate at the far end of the dirt parking area. Don’t worry, the gate is easy to walk around, and hiking to Shoshone Point is 100% OK unless it has been reserved for a wedding or other private event. After a roughly 20-minute stroll, you’ll come to a group picnic area with tables, grills and an outhouse. Shoshone Point is located at the end of the prominent rock ledge nearby. Located on the eastern tip of the Walhalla Plateau, Cape Final offers some of the best views in Grand Canyon. So why isn’t it crowded? Cape Final is only accessible via a two-mile hike, which is enough to deter the majority of North Rim visitors. If you don’t mind a nice hike to the rim, you can easily escape the crowds. The Cape Final trailhead is located off Cape Royal Road, 2.5 miles north of Cape Royal. The trail heads through an open ponderosa pine forest, then strolls past cacti and pinyon pines. Cape Final itself, reached by a faint path, can be a bit hard to find. Look for the USGS datum point (a round metal marker) embedded in the rocks at the overlook. From Cape Final you’ll enjoy sweeping views of eastern Grand Canyon, including Vishnu Temple and Jupiter Temple. Backpacking note: It’s possible to camp at Cape Final. Grand Canyon’s backcountry office grants one camping permit per night. If you’re lucky enough to snag that permit, you’ll have Cape Final all to yourself at night! This is hands-down one of the most spectacular viewpoints in Grand Canyon. From an elevation of 4,552 feet at the rim, sheer cliffs drop 3,000 vertical feet to the Colorado River. The distance from rim to rim is less than a mile, making this one of the narrowest and deepest places in Grand Canyon. And did I mention there are never any crowds? So why is Toroweap uncrowded? Because it’s is one of the most rugged and remote viewpoints in Grand Canyon. Getting there involves a 60-mile drive down a bumpy dirt road notorious for causing flat tires. Other than a primitive campground set back from the rim, there are no visitor facilities at Toroweap. In other words, it’s rugged, ragged and remote — which is exactly why people like me love it. To get to Toroweap, follow BLM #109, which turns off highway 389 seven miles west of Fredonia, Arizona.